Sure, it’s not one of the more grounded characters, but at least he’s held on to his parts. In all honesty, I have no idea why I ever got Psyche-Out. He’s a bridge character. An early sign of the silly direction G.I. Joe was going in as it approached the 1990s. I rarely played with him. Yep, that antenna is still there. That probably explains how this figure stayed in one piece. Not a lot of wear and tear. He also held on to at least two of his accessories. 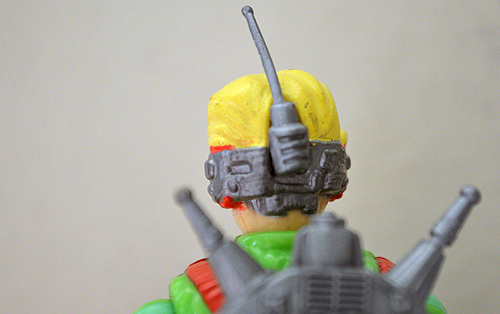 The small antenna that was plugged into his back of his head remained in place all these years. His pointy backpack also stuck around. 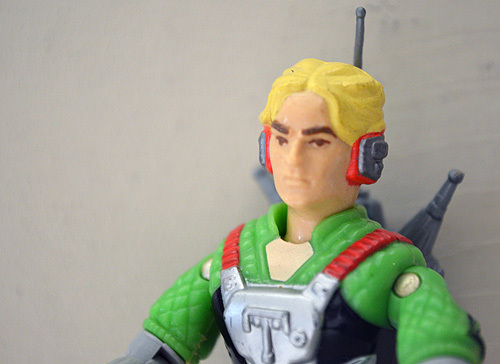 Sadly, his wrist radars have long since vanished, along with his radar pack. « May the 4th be with you… Cobra! Part of his psychological warfare must be his blond styled hair. Not a standard military haircut for sure.